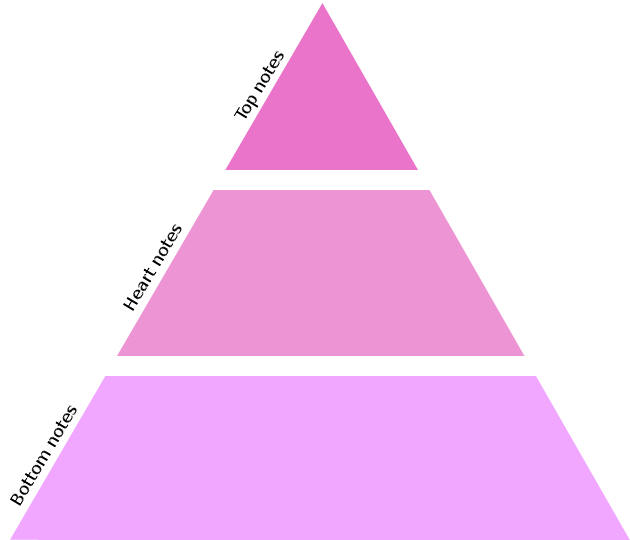 The olfactory perception of a fragrance could be conventionally represented by an olfactory pyramid. Top notes are light notes that last less. They are immediately noticed as entering a room, but vanish after a few minutes. Heart notes represent the real theme of the fragrance, they are the expression of its profusion and lasting in the room. Compared to the top notes, they are more powerful and last for a few hours. Bottom notes express the personality of the perfume, they give warmth and persistency to the structure of the essence. They evaporate slowly and vanish after a few days.